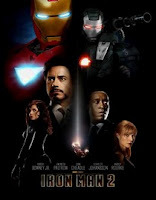 In this star-studded sequel, Tony Stark, aka Iron Man, is summoned by the U.S. Senate to testify regarding the use of his armed suit and subsequent surrender to the U.S. military as property of the American people. Tony refuses on the basis of his “successful privatization of world peace”, also alleging that most countries are, at best, ten or twenty years away from achieving his technology. Little does he know, that a Russian physicist with a forty years old family grudge is about to bring mayhem on Stark’s empire. The cynic, dry sense of humor that was Stark’s trademark in the first movie has been kept intact, thank God! Lt. Commander James Rhodes is played here by Don Cheadle rather than Terrence Howard, but I would have liked the latter to preserve more of the original elements that made this film so successful. Gwyneth Paltrow is a nerve-wreck in this installment, a contrast to the take charge Pepper Potts of the first movie. Tony’s nemesis, Justin Hammer, CEO of Hammer Industries, is a very refreshing character, and he seems to feel at ease with the competitive atmosphere of the film. The best villain in the series is interpreted by Mickey Rourke as Ivan Vanko, a brilliant physicist who has designed a suit with the same arc technology as the Iron Man suit. In summary, I really liked this film, but still the first installment reigns supreme!